It's that time of year of again. Once more, the film world's best and brightest gather in Hollywood to don their finest regalia and go to a really cool fusion pub to watch their celebrity counterparts give each other awards on television. Yes, who will win at the Oscars* this year? This means that it's also time for our annual tribute to the the nominees in the Best Picture category. They are a dazzling, motley collection, reminiscent of the tasting menu at a Scottish dim sum bar ("Spring roll or haggis dumpling?"). Let us savor them together. 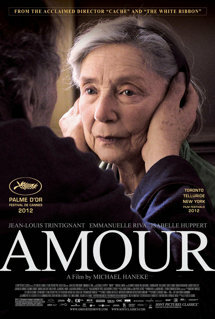 Amour tells the timeless story of love. It's timeless because while the film is only 125 minutes long it feels like a month and a half in line at the DMV. Seriously, at one point one of the leads looks out into the audience and shouts, "Take a number, and you better have your damn proof of insurance and property tax when you get up here!" The story begins with an elderly couple living in France, whiling away their retirement days eating Brie and sipping Bordeaux. Their children point out that this demonstrates just how senile they've become, as everyone knows you drink Chardonnay or Rosé with Brie. They respond with traditional Gallic expressions of disgust and/or rude bodily noises that are the unfortunate by-product of age (the screenplay is never very clear on which is which). They then decide to move to Belgium, where people are far less picky about what wine goes with what cheese, so long as Hollandaise sauce is slopped over the lot. As they leave their family, there is a stunning montage of the 57 different varieties of the "Would you like some cheese with that whine" joke. They fly to Belgium in a Vought Corsair, mainly because the husband cannot find their train tickets in one of the seven pockets in his vest (the tickets are in the band of his hat the whole time). When they land in Belgium they are immediately involved in a bank heist with shady, existentially angst-ridden criminals with an overdeveloped sense of fashion. As is the case with these movies, everyone is killed at the end in a hail of bullets and baguettes (the final scene takes place at a baguette factory). As they die, the husband whispers to his wife with his last breath, "Je t'aime!" ("I love you!") and she tenderly replies, "Prendre la parole, je ne peux pas vous entendre." ("Speak up, I can't hear you.") as they both croak. 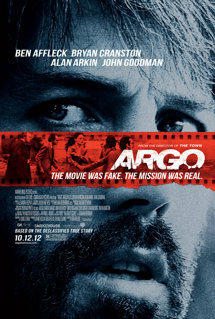 Argo is about the improbable tale of the CIA attempt to rescue six Americans in Iran during the hostage crisis by sailing the legendary boat of Jason and the Argonauts directly into downtown Tehran. This plan was even more remarkable due to the absence of any rivers flowing directly through the city. The tale begins in Hollywood, where most of these farfetched sorts of things begin, in the office of a CIA agent masquerading as a producer, so he can get the goods on communists working in the film industry. Although the government authorization for this work ended just after Joe McCarthy left the Senate, in the 1950's, Congress neglected to pass a law removing the funding for the program, leaving the agent with little to do but attend parties, wine and dine starlets, and bankroll a number of surprisingly successful films, all of which proved to be the only government investments to return a profit since Seward's Folly. The producer is enraged when he learns that Iranian radicals have taken over the American Embassy in Iran, mainly because he had a post-Oscar party planned there and had already made the down-payment on the strippers, Vought Corsair, and Columbian "nose-sugar." After the company (meaning "CIA," which is how they refer to themselves - I realize it's kind of strange, given that they are technically an agency, but they seem to think it's a cool thing to do and who am I to argue with them or the guys in the black sedan who just pulled up outside my house as I'm typing this) ...where was I? Oh, yes - After the "company" discovers that there are six American embassy workers who were not captured by the Iranian radicals, our hero convinces them that they can row the title maritime vessel of yore directly into Tehran and bring the six Americans out, all disguised as Golden Fleeces. Hushpuppy's bayou world is a harsh one, filled with poverty, loneliness, intense humidity, and oppressive Cajun chefs trying to outdo one another with catch phrases. She dreams of flying away from it all in a Vought Corsair (and who wouldn't) but is blocked by the fact that she can't get her Louisiana pilot license until she is nine. Instead, she begins to train the animals to perform in a show in the hopes of getting a gig out in Vegas, where at least it's a dry heat. The animals prove to have little talent for dancing or singing (except one of the gators, Chiffon, who absolutely nails "I Dreamed a Dream" from Les Miz - Watch your back Anne Hathaway), so Hushpuppy decides to turn them into an army instead, intending to conquer the "Southern Wild" and use the power to change aviation law. 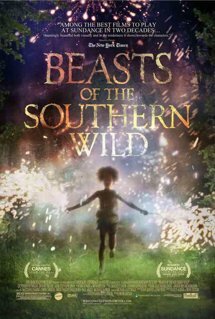 This goes well until Hushpuppy learns a tragic lesson about the value of air power in a military conflict. Her ground-bound army is defeated and turned into one of the more exotic gumbos ever served. Licking her wounds she and the surviving bandicoot return to her bayou home and she consoles herself with the thought that she only has three more years to wait before she can learn to fly and barnstorm Emeril's. With tragic irony, we flash-forward to the future, where she learns at the last harrowing second why her bandicoot friend's nickname is "Crash." 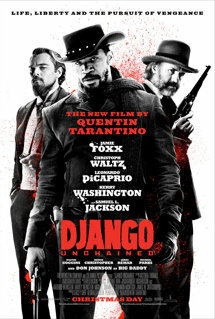 Django Unchained is a sordid, profane, terribly violent, laugh-a-minute tale about the evils of slavery and racism, and has almost nothing to do with "Rango,"the creepy lizard Johnny Depp voiced a few years ago (other than a brief cameo where the lizard's head is hacked off with a scimitar). The resourceful duo turn the liability of rebooting The Defiant Ones into an advantage, clothes-lining every slave owner and criminal in the tri-state area. They also work out a remarkable move where one of them swings the other around on the chain and then throws them at the enemy, pulling the other one along through the air, creating a physics-defying, four-fisted, four-footed, 64-toothed (don't ask) flying wall of death. This detail turns out to be one of the more plausible parts of the film. The film ends when, during a fight in a factory, our heroes slip into a vat of baby oil, allowing them both to slip off their shackles. With Django finally unchained, he is able to really wreak some havoc, attacking his enemies with nun-chucks, gatling guns, the 20 mm cannons of an F4U-1C Vought Corsair, and a hwacha. In the end, Django is reunited with his wife Broomhilda and hired by the Pinkerton Agency for special operations, leading to his memorable closing line, "If you call these 'black-ops' one more time, I'm going to kick you in the %$&@$, you %$^&*@$%&!!!" The title translates to "The Wretched," so you know it's a good time for the whole family. Jean Valjean (Hugh Jackmanhugh) is an escaped convict with a heart of gold. Literally, his heart is made of gold, due to a freak accident involving a gold smelter, a funnel, and a severe case of the hiccups. Despite this handicap, he has managed to avoid both prison and appearing in Rosland Capital commercials. He eventually becomes a wealthy factory owner and a mayor, because what ex-convict wouldn't? Unfortunately, Jean is also a kleptomaniac, with a penchant for stealing anything and everything, including the spotlight from his co-stars. This gets him recaptured, after he attempts to steal the Eiffel Tower several decades before it is actually built. He escapes again by feigning his own death, and traveling under the name "André Kaufman." 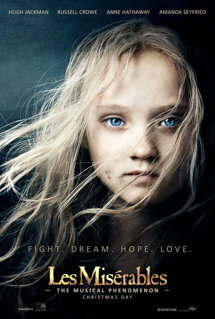 Cosette falls in love with Marius (Eddie Redmayne), and after recreating the combined story lines of All My Children, General Hospital, and Doctor Zhivago in a blistering 90 minutes, they wind up in each others arms, a result of the world's first double arm transplant. Cosette eventually learns that her mother's embryonic soft drink business (Fanta) has taken off overseas, making her wealthier than Maurice Chevalier. She is so wealthy, she is able to buy a Vought Corsair a full half century before it rolls off the production line. Meanwhile, Valjean spends his golden years hosting awards shows and scaring passers-by with his retractable golden claws. 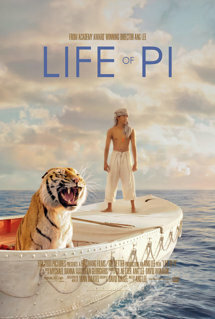 Life of Pi illustrates the remarkable tale of a young boy whose parents were obviously mathematicians. He grows up in Calcutta, being made fun of by classmates who deliberately mispronounce his name ("Hey, Pee! That's right, we're making gratuitous urine jokes to curry the favor of contemporary audiences! What are you gonna do about it?") and cruel mathematics grad school toughs ("Hey, Pi! Go and calculate yourself to a million digits, twerp!"). To make matters worse, Pi is tragically orphaned when his parents are killed by an overdose of dry erase marker fumes while trying to solve the Riemann Hypothesis. Alone, and tired of being taunted with urinal cakes and abacuses, he boards a ship, which is promptly hit by a tidal wave and an iceberg in the middle of the Indian Ocean. Pi escapes in a lifeboat with only a ravenous Shelly Winters for company. They are soon joined by a half-dressed, ravenous Kate Winslet, who keeps asking Pi if he would like to "do a portrait" of her. The twin perils are snuffed out by an even more ravenous tiger, who was hiding under a rather conspicuous tiger-shaped blanket in the other end of the lifeboat. The tiger devours both Winters and Winslet (the latter after doing a series of tasteful impressionist nudes). Turning his attention to Pi, he is distracted by Pi's repeated clever tactics to "look over there!" After falling for this no fewer than 754 times, the tiger falls into a deep slumber, dreaming of Ernest Borgnine. Pi tries to draw the attention of rescuers and is finally noticed by a Vought Corsair, which immediately riddles the boat with bullets, because, "Hey! Hungry, dangerous tiger here!" Fortunately, before any of the 1,200 rounds hits Pi or the tiger, they are saved by the derring do of Siegfried and Roy, who are looking for a new tiger for their Vegas act. They vanish in a puff of smoke, leaving the lifeboat full of penguins, and one very confused Alfred Hitchcock. 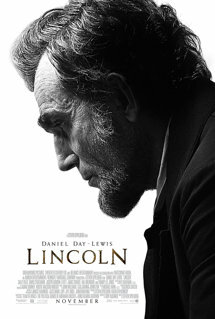 Lincoln is a majestic film about the recording of They Might Be Giants' second album. It's told as an allegory, focusing on the sixteenth president of the United States, who shared a name with the album. The film begins with John Linnell and John Flansburgh (George Clooney and Brad Pitt) sitting in a coffee shop in New York City (Julia Roberts), mulling over the song list for their upcoming studio sessions (Anne Hathaway, Gabourey Sidibe, and Ving Rhames). Simultaneously, Abraham Lincoln (Daniel Day Lewis) broods in the White House (Jim Carrey), worrying that he will not be able to pass the Thirteenth Amendment (Scarlett Johansson) before the Civil War (Danny DeVito) ends. As the two Johns settle on songs, Thaddeus Stevens (Tommy Lee Jones) offers to moderate his rhetoric in the hopes of a quick passage. He appears in Congress (Joan and Melissa Rivers) wearing a purple toupee (Weird Al Yankovic) and telling Democrats (Alec Baldwin) they've got a snowball's chance in hell of stopping the amendment. After this speech, Congress gives Stevens a standing ovation, carrying him and Lincoln (who just happened to be wrestling someone in the hall) out to the street on their shoulders. Not knowing what to do after this, they put the two men down and go off for beers (Hal Holbrook). A time-travelling Vought Corsair (Regis Philbin) passes overhead, dragging a banner that reads, "They'll Need a Crane." Lincoln the man dies, but Lincoln the album lives. 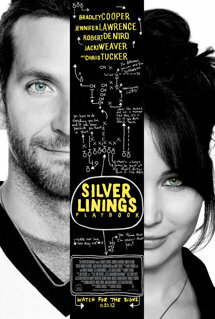 Silver Linings Playbook is a modest story about the world's most optimistic football coach, Willie Passornot. Sadly, he is also the coach of the Detroit Lions. After years of failures and missing Thanksgiving dinners, he finally decides to write the ultimate playbook. The playbook consists of 150 trick plays, and one "run up the gut." Amazingly, the run up the gut results in a dozen touchdowns in their first two games, leading the team's owner to reevaluate his plans for "liquidating the franchise, buying a beat-up VW van, and moving to a commune." Soon, the team is undefeated and the star players are getting national attention, appearing in cameos on television programs, including the newly christened, CSI: Motown, starring Tina Fey, Nick Cannon, and Russell Brand. This leads to interpersonal conflict of the sort seen in dozens of Hollywood films, only this time with brawny, violent football players with a penchant for head to head collisions. The team reels, tasting their first defeat of the season, and also a considerable amount of stage blood. This further depresses the owner, who seriously considers appearing on a television show with Donald Trump. On Super Bowl Sunday, just after the Vought Corsair flyover, Willie suffers a massive heart attack. He hands his magical playbook over to his assistant coach, Jennifer Lawrence. After reviewing the playbook she discovers that it really only consists of the lyrics to the Barney song, written in purple crayon. She convinces the team that it was their innate ability and team spirit that got them this far, and that they have what it takes to win the Super Bowl. After falling behind by three touchdowns, she realizes this isn't going to work. So, she dons her Katniss outfit from The Hunger Games and threatens to riddle them with arrows unless they shape up. They win by scoring a jillion touchdowns in overtime, even though it's sudden death. At Willie's funeral, they honor him by burying him with the Vince Lombardi trophy, at least until the NFL digs it back up again, next year. Zero Dark Thirty reveals the dark and mysterious world of how the U.S. intelligence and military communities tracked down Osama bin Laden and shot the crap out of him. ("The feel good picture of the decade!" - Stars and Stripes). 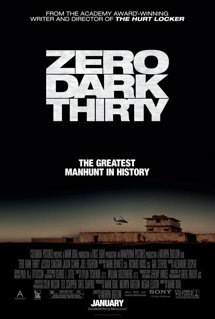 Much of the film focuses on the various techniques used to locate bin Laden, from controversial "enhanced interrogation techniques" to "a very thorough search in Google Earth for tall, Arabic guys near caves." Eventually, the agents responsible for finding bin Laden get the lead they need and pinpoint his location as "somewhere in the Afghanistan/Pakistan region." Later, they get an even better lead that includes a picture of the house he lives in, the pass code to his security gate, and an oil painting of the giant, novelty, Mohawk wig he wears as a disguise. In the end, the government agents are happy to have delivered justice but are troubled at the cost at which it came. No, just kidding, the last thirty minutes are a party scene. In the end, bin Laden sleeps with the fishes, coincidentally winding up in the same spot as Jimmy Hoffa. *Or as some actors and actresses describe the award, "That buff, naked little man with the impressive sword!"